An electrical malfunction in an office building causes a fire. The fire department rolls up to the building, sirens blaring. They rush to the fire hydrant, connect their hose—and no water comes out. Whoops. Fire hydrant maintenance is—quite literally—a life-or-death proposition. The following information on fire hydrant operation and maintenance provides insight into this process. These tips apply to the dry-barrel hydrants commonly used on water distribution systems in the Midwest. 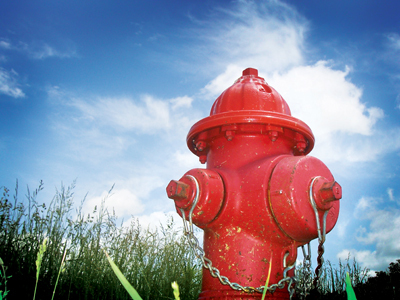 Fire hydrants must be operated properly, so adequate fire protection can consistently be provided. Always use a hydrant wrench when operating a hydrant. Repeated use of a pipe wrench on the five-sided operating nut will round off the nut so a hydrant wrench will no longer work. After opening the highest port, slowly open the hydrant valve a few turns until water has reached the open port. Flush any debris that may be in the hydrant barrel. When the water is clear, slowly open the hydrant fully. It is important to displace trapped air from the hydrant barrel. Compressed air could cause problems. Remember that air is compressible, and water is not compressible. Sometimes the internal hydrant valve may not function properly due to debris or mechanical problems. Whenever possible, attach an operating hand valve to the port from which water will flow. If flow from the hydrant cannot be completely shut down using the operating nut, use the hand valve to stop flow, and then close the control valve on the hydrant lead to completely shut down the hydrant so repairs and/or replacement work can be done. Very old hydrants should not be operated by inexperienced personnel because hydrants may not seat well when closed and may be left running. Also, an inexperienced person may break the stem while forcing it in an attempt to get the hydrant to stop leaking. Therefore, the use of a pipe or “cheater” bar should be discouraged when operating an older hydrant. Flow should be diverted by diffusers, hoses or other equipment. Proper traffic control should be provided as needed. Fire hydrants must always be operable and capable of providing adequate fire protection, so systematic maintenance and inspection are vital. Repairs can be scheduled proactively instead of reactively, and problems can be dealt with before they become catastrophic. Hydrants should be inspected on a regular basis at least once a year. Dry-barrel hydrants may require two inspections per year, in the spring and fall. Every hydrant inspection should be documented, and problems with a hydrant should be reported immediately. Remove one nozzle/pumper cap and, using a listening device, check for main valve leakage. Using a plumb-bob, check the barrel for water or ice. Pump water out of the hydrant barrel, wait a few minutes, then recheck with the plumb-bob to verify that water is not passing through the valve on the hydrant lead. Replace the nozzle/pumper cap, leaving it loose enough for air to escape. Open the hydrant a few turns to allow air to vent from the loose cap, and then tighten the cap. Open the hydrant fully, checking for ease of operation. Repeatedly exercise the operating stem, as needed, to remove buildup and promote better operation. If lubrication or stem replacement is required, schedule the necessary work. With the hydrant fully pressurized, check for leakage around the flanges, nozzles/pumpers, seals and operating nut. Partially close the hydrant to open the drain outlets, and flush for 10 to 15 seconds. Completely close the hydrant, and then open it a quarter- to a half-turn to relieve the pressure on the thrust bearing or packing. Remove a nozzle/pumper cap, and attach a diffuser, if needed, along with a hand valve for control. Flush the hydrant to remove foreign material. Close the hydrant and remove the diffuser. Place your hand over the nozzle/pumper to check for suction as the water drains out of the barrel. Check for hydrant leakage with a listening device. Remove all nozzle/pumper caps and inspect the threads. Clean and apply approved lubricant to caps and nozzles/pumpers. Inspect cap chains for binding and ease of movement. Unbind or replace as necessary. Replace the caps and tighten them. Check operating nut lubrication and maintain as needed. Inspect breakaway flange for damage if present. Collect or verify the GPS location of the hydrant. This is very helpful when locating a hydrant under a pile of snow. Notify utility personnel and fire department personnel immediately of inoperable hydrants needing repair or replacement. Get stakeholder buy-in. Static pressure reading taken documenting time and date. During a static pressure test, do any of the nozzles, gaskets or drainage holes indicate leakage? With a nozzle-cap or pumper-cap removed, and using a listening device, does the main valve leak? Is there any “ponding” or standing water near the base of the hydrant? What is the condition of the paint? Is the color correct, based on the utility’s color scheme? Is the hydrant straight-up (plumb)? If not, does it appear that the hydrant has been hit by a vehicle? Should bollards be installed to protect the hydrant? Should the hydrant be relocated away from traffic? Does the hydrant need to be raised or lowered? Do the pumper port and nozzles face the correct direction? Is the soil surrounding the hydrant capable of supporting it? What is the GPS location of the hydrant, if required? Are nozzle/pumper threads in working condition? Do the nozzle/pumper ports require any maintenance or need to be replaced? Does the hydrant drain properly? Is the hydrant barrel still dry after pumping out the water and waiting a few minutes? Does it provide adequate fire-flow? Is the operating nut of the hydrant in good condition? Have the corners of the operating nut been rounded off from people using a pipe wrench instead of a hydrant key? If it appears that the hydrant has been illegally operated, should protective devices be installed to deter vandalism? Does the hydrant need to be raised? Firefighters need to be able to spin their wrenches to remove hydrant caps. If a hydrant is too low, time spent removing caps could be deadly. The Minneapolis suburb of Burnsville, Minn., stands out in its devotion to hydrant inspection and maintenance. Burnsville (population: 61,000) comprises more than 3,800 hydrants. Around two-thirds of these are public hydrants, which the city inspects. The other third are private hydrants, or those on “private” water mains—including hydrants for commercial properties, apartment buildings and townhome developments. Fire codes dictate each hydrant be inspected annually. In 2013, the city of Burnsville began a private hydrant inspection program, hiring a company (M.E. Simpson Co. Inc.) to inspect those private hydrants that did not already have independent inspections. Burnsville then added the price of inspection (typically $55, divided into monthly payments) onto the property owner’s water bill. Maintenance for the private and public hydrants includes, among other things, flushing, which helps to remove mineral deposits in water mains; checking on rubber gaskets and moving parts, wear and tear on which can create leaks; and ensuring that the hydrant has not been damaged (e.g., if a car or truck runs into a hydrant, knocking it off of its rod). Minnesota’s freezing weather also poses potential issues, as leaking water, when frozen, can damage the hydrant. The private hydrant inspection program has been a resounding success, according to Linda Mullen, utilities superintendent for the city of Burnsville. “The first year [of the private hydrant inspection program], we had 30 hydrants that, when we went to do the inspection, there was no water. Now, all of the hydrants are in compliance,” said Mullen. Michael Simpson is CEO of M.E. Simpson Co. Inc. Simpson can be reached at [email protected] or 800.255.1521. Additional reporting by Sara Samovalov.